Yesterday, Hobbit fans were treated to a very special fan event with Orlando Bloom, Evangeline Lilly, Lee Pace and Luke Evans. In case you missed it, check out the video below and read on for why we’re so excited about The Hobbit: The Desolation of Smaug (opens in UK cinemas on 13 December 2013). There’s now only a month (or so) to go until the second part of Peter Jackson’s second JRR Tolkien trilogy arrives in cinemas. Whilst we have to admit An Unexpected Journey didn’t quite live up to expectations (and it wasn’t helped by the 48 fps debacle) we have enough trust in PJ to hope that part two of Bilbo’s adventures will bring back some of the Lord of the Rings magic. Martin Freeman is back as Bilbo and once again he’s joined by Ian McKellen as Gandalf, Richard Armitage as Thorin Oakenshield and the whole motley crew of dwarves we were introduced to in part one. This time the adventurers encounter scary spiders, a brand new character created just for this film and the mighty dragon himself. We’ve been teased in the trailers but we’re all desperate to see just how Jackson and co have brought the mighty beast to life. We know he’s used Mo-Cap again and if it’s half as good as when they created Gollum then we should get to see a fully realised creature. With Gollum, Jackson employed the talents of the little known Andy Serkis (who should have been nominated for a Supporting Actor Oscar for the role). This time Jackson has upped the ante and asked the Hottest Actor On The Planet Right Now Benedict Cumberbatch to prance around in a clingy suit and have millions of dots stuck to his face. Listening to the snippets we’ve been teased in the trailers, you can hear a bit of Cumberbatch in Smaug. And we get to see Cumbers acting against his Sherlock co-star Freeman and we all know what great chemistry they have. Plus, Cumberbatch has also taken on the role of the Necromancer, so will we see more of him in this film or the final part of the trilogy? 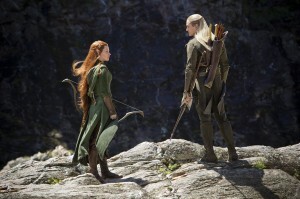 It’s the return of Super Elf Legolas aka Orlando Bloom (who hasn’t really done that much since the end of LOTR). 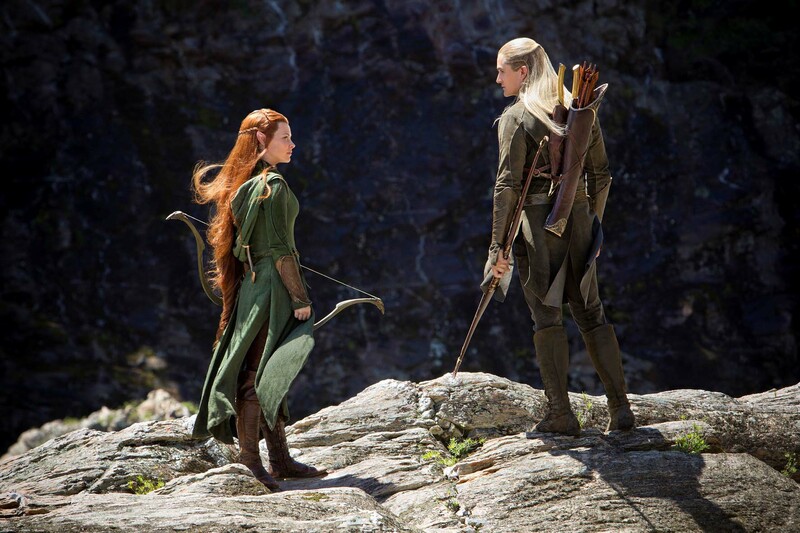 This time Legolas gets to spend his time with a foxy female Elf rather than a beardy, grumpy Dwarf. Evangeline Lily joins the cast as Tauriel, a brand new character created for the films and not part of Tolkien’s original text. Will this work? And will fans take to the idea of a love story for Leggy? We’ll also get to see more of Elf King Thranduil played by Lee Pace. We only really had a glimpse of him in Journey but it looks like he’s got a much bigger part this time – and I’m sure we’ll see even more of the character in part three, There And Back Again. Now I know some people love McKellen’s Magneto but for me he is Gandalf. Every time I re-read the books, McKellen’s voice is inside my head – he just IS the wiley old wizard. In Tolkien’s story we lose Gandalf for a while but I’m hoping Jackson realises just how popular the character and actor are and McKellen’s not off screen for too long. The only thing that worries me is that by the looks of the trailer more Gandalf means more Radagast (Sylvester McCoy) and I really wasn’t a fan. And if that AWFUL rabbit-sleigh thing appears again I will be throwing my popcorn at the screen. It really looked horrible in the first film. As the Dwarves and Bilbo approach the Lonely Mountain they have a stop-off in Lake Town and we get to meet Bard the Bowman (Luke Evans) and The Master (Stephen Fry). I know Bard is a beloved character and lots of people are excited to see him on screen, he always reminded me of Aragorn (I read Lord Of The Rings first) but I’m looking forward to seeing Fry at his most pompous as the Master. Hopefully he’ll also bring a bit of comedy to the proceedings. As excited as we all are about Smaug, I can’t wait to see how PJ lifts the character of Beorn off the page and onto the screen. Again, we’ve been teased with glimpses (mostly in the poster with Gandalf) but will the pictures I have in my head be the same as Peter’s? Beorn is one of my favourite characters in the book so I expect him to be given his full dues in the film. I suspect one of the big set pieces of this film will be the Barrels sequence. I don’t want to spoil it for those who haven’t read the book (and if you haven’t then you REALLY should) but I’m excited to see the Dwarves’ escape from the Elven King. It should be a rollercoaster ride and hopefully we’ll be taken right into the middle of the action. Again, we’ve been teased in the trailer but I can’t wait to see it on the big screen – and if it’s in 3D it’ll be even more epic. Lastly, there is one part of ‘Smaug’ that I’m not too sure about – why has Peter Jackson asked Ed Sheeran to compose the closing credits song? Really PJ, must you subject us to that? The Hobbit: The Desolation of Smaug opens nationwide across the UK on 13 December 2013. Competition: Win Life After Beth on Blu-ray! 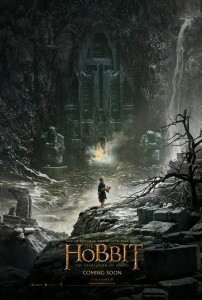 One comment for "6 Reasons we’re excited for The Hobbit: The Desolation of Smaug"